Practical, functional and innovative, The Greenstick has undergone rigorous testing and has been manufactured to the very highest standards. Its the must have golf accessory for the considerate golfer who wants to look after the golf course. This two pronged professional pitchfork has been specially designed to effortlessly repair any impact damage to the putting green caused by the golf ball’s landing. 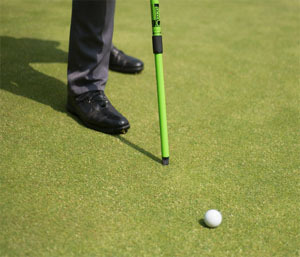 Ball marks or pitch marks are the bane of smooth putting surfaces and healthy greens on golf courses all over the world. Avoiding making ball marks is impossible but the considerate golfer must always look to repair these depressions often made when the ball descends from the sky onto the green. Repairing ball marks isn’t just good golfing etiquette, it’s our obligation as golfers to look after the golf course, so if you have the time repair not just your ball marks but anymore that you spot, even if they are not yours! A ball mark repair tool or pitchfork is an essential piece of kit for every golfer, traditionally these are hand held tools. The challenge for the senior golfer is of course bending down. 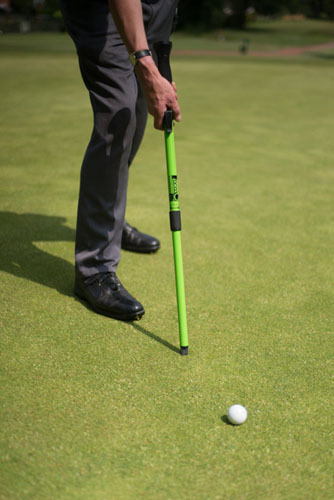 The adjustable telescopic shaft on the Greenstick ensures that the considerate golfer can make swift and accomplished repairs to any ball marks on the green and pick up their golf ball, without the need to bend down or stoop over. There is a right and a wrong way to repair ball/pitch marks on the green. Its important that you insert the prongs at the edge of the depression made by the ball not the centre! Insert the prongs at the edge of the depression working your way around using a gentle twisting motion. Many golfers make the mistake of inserting the prongs at an angle and ‘lifting up’ the centre of the depression, unfortunately the only thing you will achieve using this action is to rip up the grass roots, killing the grass. Use the prongs to push grass at the edge of the depression toward the centre. When you have worked your way around the rim of the depression, pushing the grass towards the centre, gently tamp down the repaired ball mark with your putter or foot to smooth the putting surface. With adjustable handle on the Greenstick you can extend the tool making it perfect for your height, avoiding any unnecessary bending over. Do you do business on the Golf Course?